This DNA-induced damage manifests itself years later in a variety of forms. 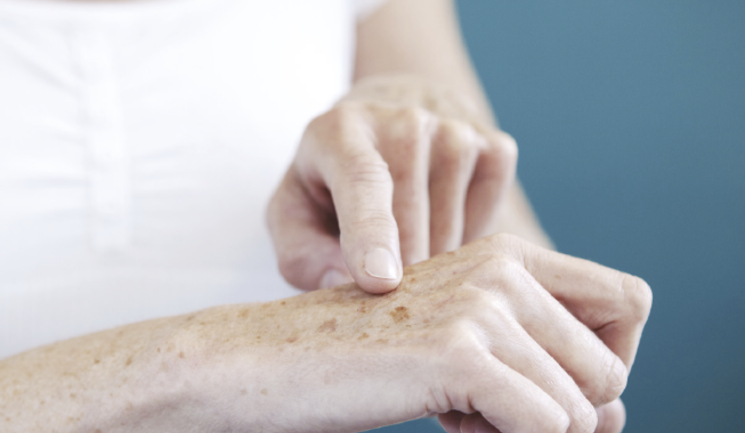 These include thinned skin, wrinkles and abnormal pigmentation. The skin on the hands is one of the most exposed areas of the body, and often patients do not think to apply sunscreen in this area so damage can be obvious. This prompts many patients to seek treatment to reduce the signs of ageing on the hands. There are a wide variety of approaches to rejuvenate the hand, all of which depend on the problem. 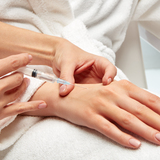 This ranges from dermal filler injections to skincare, chemical peels, lasers and more. Wrinkles can also be treated with the above approaches, but often more is needed to achieve best results. Like the face, there are a variety of lasers and radiofrequency devices that can be used to treat wrinkles on the hands. There is a wide variety of sun-induced pigmentary changes ranging from melasma to diffuse hyperpigmentation. The most common form is called solar lentigines, also known as age spots or liver spots, although, they have nothing to do with age or liver-related issues. Solar lentigines are the direct result of excess sun exposure and can be seen on any sun-exposed area; however, patients most commonly present for treatment for lentigines on either the face or the tops of hands.6 A wide variety of methods have been used to lighten these brown spots. These include bleaching agents, peeling agents, non-specific destructive approaches and energy-based devices. 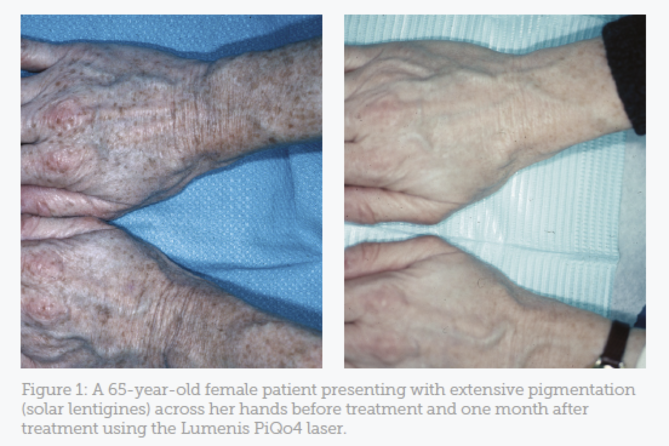 A 65-year-old female patient came to me with extensive pigmentation (solar lentigines) across her hands and was seeking a solution. She had previously treated her solar lentigines for almost an entire year using prescribed hydroquinone bleaching creams, without success. She wanted improvement with a single treatment, minimal discomfort and quick healing. We reviewed the possibility of approaches including other bleaching creams, destructive modalities, light sources and lasers. We decided that laser treatment would be the best option for this patient because it could achieve her aforementioned goals. I chose to use the Lumenis PiQo4 laser. This laser can produce four different colours of light (532 nm – green; 650 nm – red; 585 nm – yellow; and 1064 nm – infrared). It produces both nanosecond and picosecond pulses and is a high-powered device, with varying spot sizes that range from 2-15mm.13 For treatment of solar lentigines, very low energies are required, leading to minimal wounding, minimal discomfort and fast healing. I explained to her that healing on the hands may take one week longer than on the face. I also said that she will continue to get newer spots in the area after the treatment because of her extensive sun exposure throughout her life, even if she were to apply a high SPF regularly thereafter. I also said that she will possibly require two treatments using this laser, which in retrospect she did not need. I also discussed the benefits of PiQo4 compared to other technologies as, in my experience, it results in less discomfort, quicker healing and better results than other modalities. The PiQo4 laser provided a fast and effective treatment solution. A low energy was used so there was almost no discomfort with treatment and healing occurred within one week. The results were seen one month later when the patient came back into clinic for a review. As the results were better than expected, we decided that the patient did not require a second treatment. She had total clearance of her lentigines. I recommended that she continue to use sunscreens with SPF 30 or higher on the area to help maintain the results and to prevent further skin damage. However, I also made sure that she understood the periodic need for more treatments for new spots as they arise. There are many approaches to rejuvenating the hands, depending on whether the patient has thinned skin, wrinkles or abnormal pigmentation. 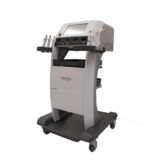 I have found that laser represents an ideal treatment for solar lentigines, in addition to its use on other forms of pigmentation as well as scars. Disclosure: Dr Goldberg has received a research grant from Lumenis. Ganceviciene R, Liakou AI, Theodoridis A, Makrantonaki E, Zouboulis CC. Skin anti-aging strategies. Dermato-endocrinology. 2012; 4(3):308-319. doi:10.4161/derm.22804. DeHoratius DM, Dover JS. Nonablative tissue remodeling and photorejuvenation. Clinics in dermatology. 2007;25(5):474-479. Gonzalez N and Goldberg DJ. Evaluating the Effects of Injected Calcium Hydroxylapatite on Changes in Human Skin Elastin and Proteoglycan Formation. Dermatol Surg. On file. Sezer E, Erbil H, Kurumlu Z, et al. A comparative study of focal medium-depth chemical peel versus cryosurgery for the treatment of solar lentigo, Eur J Dermatol. 2007 Jan-Feb;17(1):26-9. Epub 2007 Feb 27. Marta I. Rendon, et al., Evidence and Considerations in the Application of Chemical Peels in Skin Disorders and Aesthetic Resurfacing, J Clin Aesthet Dermatol. 2010 Jul; 3(7): 32–43. Mohamad Goldust, Farideh Golforoushan, et al., ‘A Comparative Study in the Treatment of Solar Lentigines With Trichloroacetic Acid 40% Versus Cryotherapy’, Cosmetic Dermatology, 2011. Farhaad Riyaz, David Matthew Ozog, ‘Hand rejuvenation’, Seminars in Cutaneous Medicine and Surgery, 2015, 34(3):147-152.